Burundi has seen a period of unrest following the failed coup d’état by a Burundian general in May 2015. 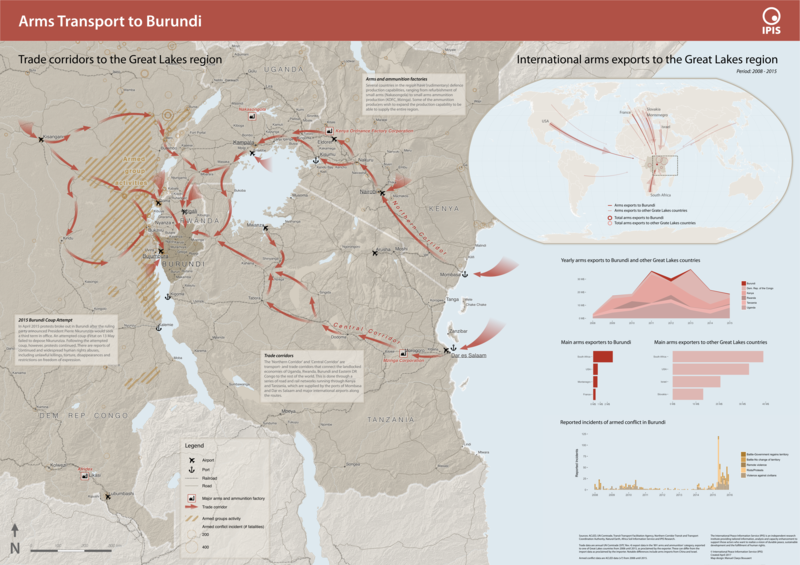 In order to better understand the situation, IPIS drafted a new map entitled ‘Arms transport to Burundi’, which puts the 2015 unrest in the geographical perspective of the Great Lakes region and in the relevant timeframe covering 2008 to 2015. The map highlights two important factors in the recent conflict: the role and power of the army, and the reported incidents of armed conflict. The map focuses on the regional area of the Great Lakes region. Recent incidents of armed conflict are displayed, revealing their geographic pattern. An extra chart on the timing of the incidents clearly shows the rise of conflict in Burundi in 2015 and the evolution in types of incidents as the conflict develops. Furthermore, the power of the army is gaged via recent international arms export to Burundi and its neighboring Great Lakes countries. The map displays the regional transport corridors used to transport these arms or other goods. The visualisation of the main arms and ammunition factories in the region completes the map.